It is no secret that creative work has not been flying off the walls in the current art market, but there is something about the theme of 225: Artists Celebrate Kentucky’s History, hanging this summer in the Kentucky Artisan Center at Berea, that has provoked an unusual number of sales, including the mixed media construction that I titled I Must Have Kentucky and featured here in March. The kind folks at the Center asked me to deliver a replacement piece sight unseen. Sounded good — but the first work had made a serious dent in my stash of Kentucky-related scrap. I’ll admit that I scratched my head about what I could come up with. 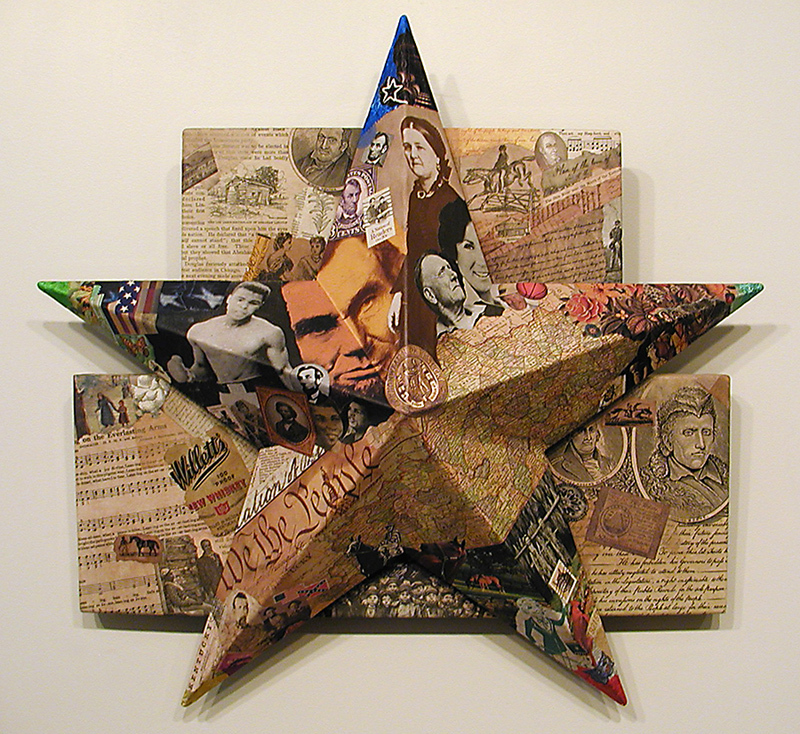 Fortunately, I had a second salvaged metal star that enabled me to utterly obliterate what was left of my repository of images with any connection to the Bluegrass State, including material from discarded books, hymnals, maps, magazines, product labels, and postage stamps. I began with a goal of contrasting a simple dimensional configuration with a density of images and symbolic messages, but I was a bit dubious about where it would lead me. I recall the distinct turning point when I took comfort in the thought, “This is starting to look good. This just might work out.” How can one go wrong with images of Kentucky’s towering native sons? Her historical presence will always be linked to Abraham Lincoln (perhaps America’s greatest president, and who has come to represent much more to the world), as well as Louisville’s Muhammad Ali (perhaps America’s greatest athlete, and who also has come to represent much more to the world). Either, or both, can be called “The Greatest.” Can any other state match that? Other individuals featured in the work are Lincoln’s first lady, Mary Todd — plus Daniel Boone, Simon Kenton, Loretta Lynn, Robert Penn Warren, Ephraim McDowell, Ned Beatty, Frederick Douglass, George Rogers Clark, and Jefferson Davis. 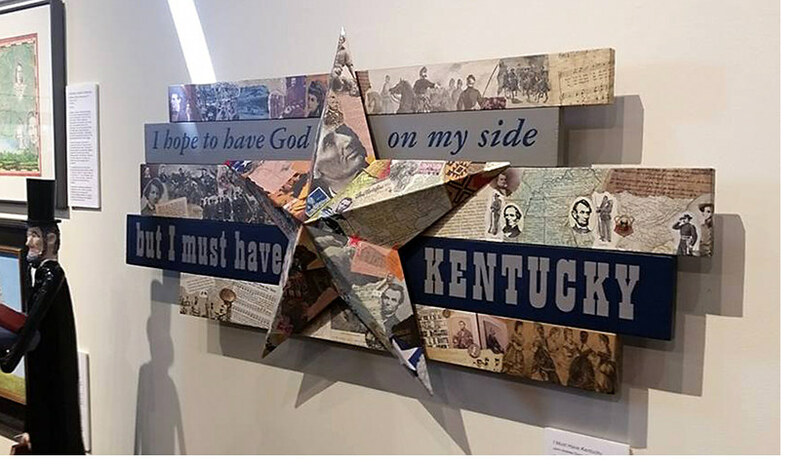 The viewer will also find visual references to faith, sport, thoroughbreds, whiskey, coal, tobacco, the U.S. Constitution, and the Civil War, with an institution central to the bitter national conflict: slavery. I am pleased with how the companion to its larger half-brother turned out. Perhaps it also will find a home, and then I can assign myself to replenishing my Kentucky file. The show lasts until September 23rd. As I’ve probably told you before, I enjoy creating works that have visual appeal from across a room, but also provide a depth of interest on close observation, with stimulating details at an intimate viewing distance. A future entry will zoom in for another one of our nosey examinations. 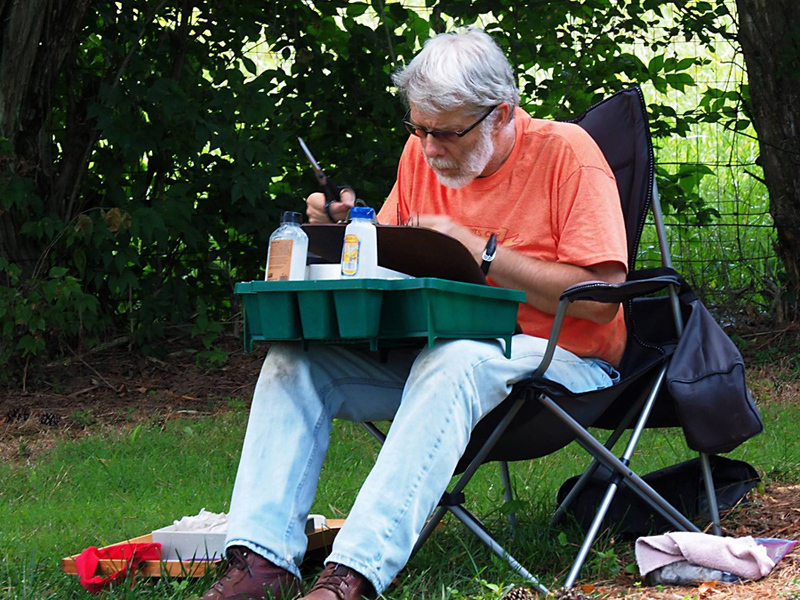 I joined the Plein Air Artists of Central Kentucky on one of their regular “art-outs” with a totally different system than I used in my first venture. 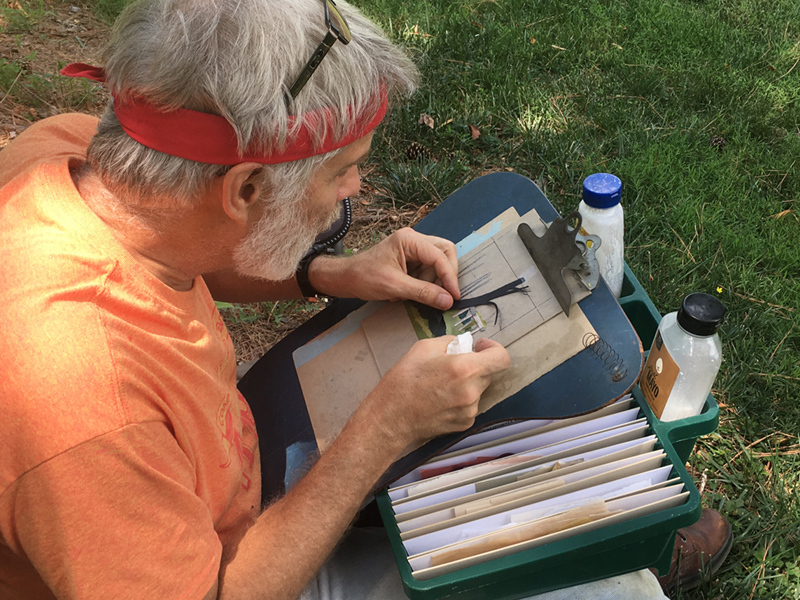 Louis Degni is marketing an outdoor kit for collage artists that he calls the “St Hilaire System” (named for artist Elizabeth St Hilaire). His design may work fine, but the idea of using cups to control available source paper did not appeal to me, so I put together a different configuration based on a re-purposed plastic dish drainer. Using custom-cut folders fitted to the 14 dish slots, I have an array of potential ingredients that are fully protected from the wind. Needless to say, even a mild breeze can play the devil with small scraps of paper. After I got to the site and picked my location, I sorted through a spectrum of colors to choose a palette. A central compartment between the little folders provides storage for this selected material under the large clipboard that secures my working surface. Bottles with two different adhesives fit handily into what was originally meant to hold kitchen flatware. The scale is ideal for a collage miniature. Additional refinements are anticipated, especially if I decide to increase the working dimensions, but I now have a solid approach that allows me to concentrate on capturing the essence of the scene. The hospitality extended by our hosts for the day was remarkable. I was free to roam the property and found a grape arbor that had seen better days, but still looked handsome in a patch of sunlight. My subject may have been too complex for the time slot, or, more likely, the process remains slow, since my layering method is still inefficient. 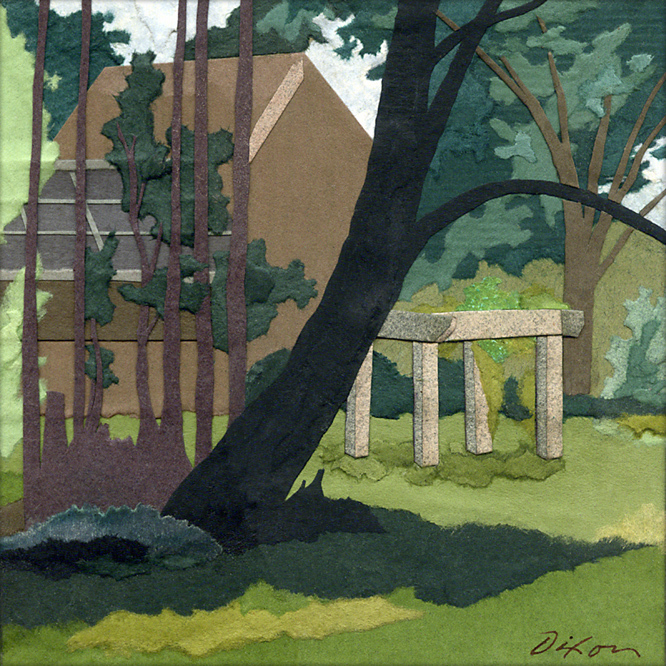 I wasn’t able to complete all the foliage on site, so I had to spend some studio time the following day to finish up. I’ll admit to being pleased with the results, although I hadn’t expected to be satisfied with my early attempts. I have no idea where this is heading, but I’m happy to follow my enthusiasm to the next phase! 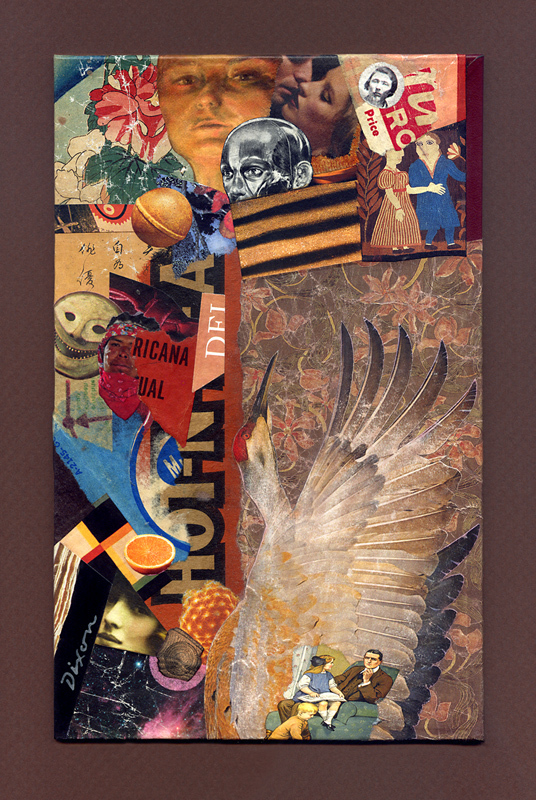 Although I perceive aesthetic currents of spatial counterpoint, color harmony, and design unity, I find it nearly impossible to rationalize most of my individual collage compositions. As in most improvisational activity, there is sufficient value in the opportunity for mystery, surprise, discovery, and joy — plus, of course, the subjective response of each receptive observer. You are currently browsing the The Collage Miniaturist weblog archives for July, 2017.